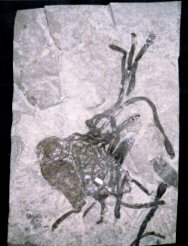 This association of plant and animal from the Silurian is extremely rare in the fossil record. The early (vascular?) plant, Cooksonia, is associated with an Eurpterus exoskeleton. This species is one of the earliest forms of terrestrial flora, from a time that plants were first evolving features for land-based living. The plant was growing from the discarded molt of a sea scorpion. The diminiative Cooksonia (a few cm) are considered to be transitional fossils, that is, a transitional form between non-vascular bryophytes and true vascular plants, as their fossils include the oldest known plant to have a stem with putative vascular tissue. Reference: Edwards, D; Davies, KL& Axe, L (1992), "A vascular conducting strand in the early land plant Cooksonia", Nature 357 (6380): 683–685.